Camping in Sangla is the best way to have the adventure in the lap of the nature. Dare Adventures make arrangements for tent accommodation in particular camping grounds. Camping in Sangla Valley packages offered by us have complete range of adventure activities available in Sangla Valley. The options may include food, lodging, adventure activities and bonfire. The best months of the year for Camping in Sangla Valley are from March to middle of September to the first half of November. Warm clothes are highly recommended. 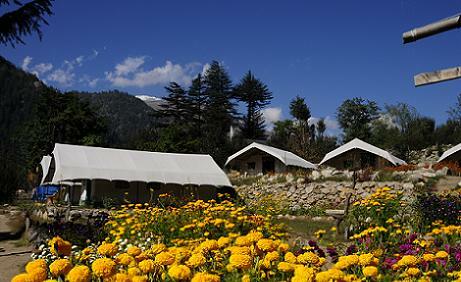 Camping in Sangla Valley: Our campsite is located at a height of 2600m from sea level. Sangla valley is considered Kinnaurs most beautiful site with the massive Kinner Kailash peak towering over it. The slopes of this valley are covered with cedar, pine ,walnut, apricot trees, apple orchards, fields and picturesque hamlets.The Baspa river which originates in the valley flows west through it to meet the main river Satluj at Karchham Sangla Valley is adorned with the beautiful villages of Chitkul, Batseri, Kamru, Raksham and Chasang. The village houses are an epitome of wooden craftsmanship.The religion of the people is a remarkable mix of Hinduism and Buddhism. Sangla Campsite Situated in the lush green forests of cedar and pine it provides luxury tented accommodation and also offers a multitude of other Adventurous Activities like Rock Climbing, Rappelling, Nature Trails, bird watching and River Crossing. Road: The fastest way to travel is via Shimla. Delhi to Shimla by road is 375kms. Shimla to Kinner Camp, Sangla by road is 240kms..
Rakcham Village- A two hour walk crossing the Baspa River takes you to the quaint Rakchham village. There is a glacier which is easily accessable from this village but is safe to walk on only in the summer months of May and June. You can sit by the river and enjoy a delicious packed lunch that the camp staff provide you. Chitkul: It is the last Indian village bordering Tibet. The temple of Goddess Mathi, which is often visited by locals for wish fulfilment is a must see. Kalpa Village: A three hour drive takes you to Kalpa village to get a panoramic view of the other face of Kinner Kailash. It is popular for its chilgoza orchards.